Mixing denim is definitely a hit-or-miss trend. The result is either pulling it off or looking like a disaster from the 80's. Common sense says pair different coloured denims together so you don't end up looking like you're a factory worker donned in denim overalls or a cowboy/girl from the wild wild west. Three bits of advice that may help. One, try to make sure that the denim items complement instead of just contrasting with each other. Two, make it look like you meant for your denim to be mismatched to look effortlessly cool. Three, use different cuts and textures so the overall look isn't dated. Also, make sure your denim apparel fits well. 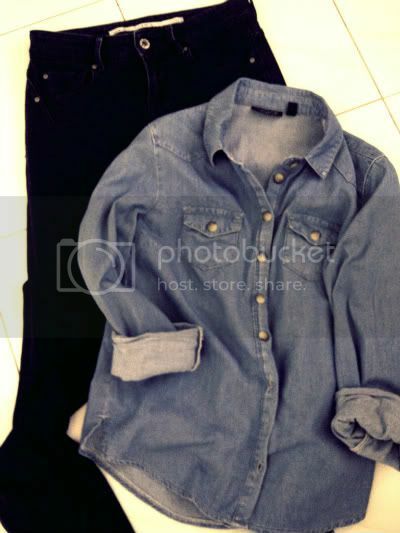 I paired a soft, fitted, light-washed denim shirt with dark denim jeans. I chose jeans with a dark wash closer to navy than to black. Its understated and effortless to pull off.